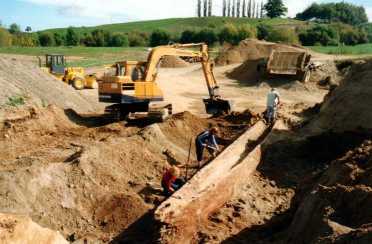 A partially complete waka, unearthed eight kilometres east of Otorohanga in April 2002, is the first in New Zealand to be uncovered at its construction site. 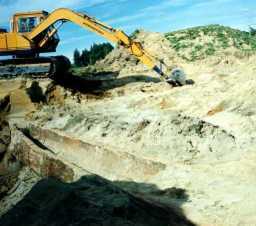 Brian Withers of River Run Products Ltd. struck what he thought to be a tree trunk with his digger whilst clearing topsoil for dry mining river metal about 100 metres from the banks of the Waipa River. 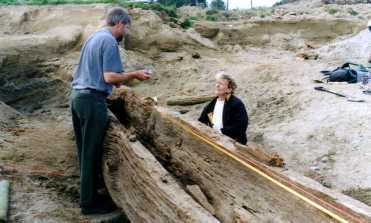 The parallel sides made Brian realise this was no ordinary log of wood and he proceeded to carefully clear more sand away, revealing the 11.8 metre, unfinished waka. Realising the significance of his find, Brian immediately contacted the Department of Conservation, who in turn advised the Historic Places Trust and local iwi. I never gave it a second thought, said Brian, who was surprised and dismayed to discover that many people he spoke to afterwards thought he should have kept his mouth shut. I'd say around 70% of people I have talked to since told me they would have busted it up and carried on working, pretending they'd never seen it if they were me, he said. Considering [the find's] historical significance, I just couldn't believe so many would think like that. Brian had nothing but praise for the archaeologists who quickly cordoned off a 12m x 3.5m area, allowing the dry mining work to continue. They trusted me to be careful enough when working close to the waka, and did their thing in as short a time as possible, said Brian. 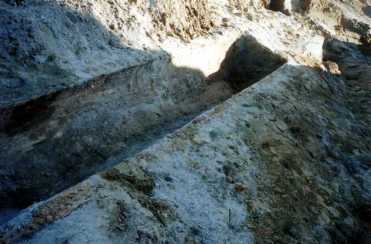 The archaeological operation was run jointly by Dr Neville Ritchie, the Department of Conservation's Waikato Conservancy archaeologist, and Dr Rachel Darmody, the Historic Places Trust Regional Archaeologist based in Tauranga. Agreement was reached with the Ministry of Heritage and Culture that they would meet the costs of the recovery operation. On the advice of professional conservators, Brian Withers sprayed water over the waka twice a day to stop the timbers drying too quickly and cracking. Members of the local iwi erected a protective shelter of scaffolding and tarpaulins while the team worked on the site. The half-completed waka still had some tree roots at one end, but the bow end had been shaped and the core almost completely hollowed out. Samples of the wood were tested - confirming it to be totara, the preferred tree for making waka. Because of the angle and sharpness of some of the cuts, the archaeologists believed it was made with steel tools and estimate it to be about 150 years old. Neville Ritchie was certain that the waka was found at its construction site. We found several good-sized wood chips around the waka - especially at the bow end - which is fairly substantial proof that the shaping and hollowing out was done insitu, he said. Weathering of the exterior indicates that the waka was exposed for some time before being gradually buried by floodwash and subsequently forgotten? He believed it might have been abandoned because the log was not as sound as the craftsmen first thought, but cannot rule out a cultural reason such as a transgression of tapu. The truth, however, will remain buried in the past. There was much debate between the iwi members present about where the waka should be taken for conservation and permanent display, but eventually support for kaumatua Ben Ranitaawa's preference that it be taken to the Otorohanga Museum. During preparation for the lift, he blessed the waka. Removal of the eight tonne canoe was a challenge for local contractors. The lift and shift was organised by Peter Gray of Dairy Tech. Otorohanga. When the six tonne Hiab crane on his truck found the going tough, he arranged for a 30 tonne capacity Tadno truck-crane to complete the job. 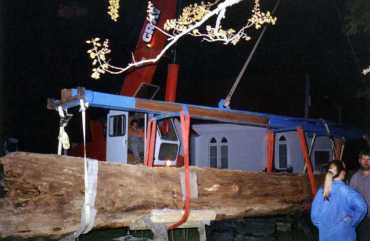 The crane operator deftly manoeuvred the cumbersome, precious vessel onto the truck for the eight kilometre drive to the museum, where the waka was gently offloaded and laid to rest on temporary piles. Volunteers from the Otorohanga Museum worked long hours during 2003 to slowly dry the waka and apply chemicals to ensure its preservation, all the while lobbying any who would listen to requests for funding. The Waka is now housed in a purpose built waka house beside the Otorohanga Museum.